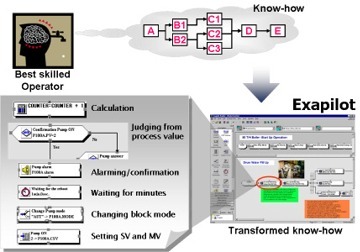 Modular Procedural Automation (MPA) provides a flexible methodolgy to capture, optimize and retain procedural knowledge in a process plant while meeting requirements in reliablity, flexiblity, and lifecycle costs. Process plants of all types are dominated by procedural activities which are critical to operate safe and efficient plants. These procedural activities reside in, manual SOP's, legacy control systems and often undocumented operator knowledge that has been acquired through years of experience. With the high rate of senior operations personnel retiring, much of this knowledge is being lost to the new generation of engineers and operators. Inadequate availability of accurate procedures can lead to operation errors. With an emphasis on plants running at optimal efficiency and continuous vigilance on safety, it is critical that the operational knowledge and best practices are captured by the enterprise and are executed consistently and accurately. Industry leaders have recognized that there is a need for a standard around automating procedures and have formed the ISA-106 committee whose purpose is to develop standards, recommended practices, and technical reports on the design and implementation of procedures for automating continuous process operations Yokogawa has been involved in this standardization effort and has developed a solution offering that address the issues covered in the emerging standard- Modular Procedural Automation. Vigilant Procedure consulting and tools - Best in class tools, capabilities, & consulting expertise of embedding procedure implementation modules into the control system architecture based on operational requirements. Knowledge Engineering - MPA consultants and engineers are experts at capturing and documenting currently used procedures whether they reside in a manual, legacy control system or in operator's heads. Modular Engineering – Standards based design based on the emerging ISA-106 standards work and development methodology assures that your procedural investment will remain reliable and pertinent to your operating staff. Advanced Decision Support Integration - Procedures are integrated into high performance HMI and alarm systems to provide operators a high level of situational awareness in all process conditions and states. Even though production control systems automate most of an industrial plant's operations, operators are still required to manually intervene for non-routine processes such as plant start-ups/shutdowns and product load/grade/recipe changes. Start-ups and shutdowns may occur very infrequently, even just once in a few years. Product switchovers, on the other hand, can be an everyday occurrence. Experienced operators know every step of these procedures, but what happens if no one like that is immediately available on site? Will other less experienced operators be able to cope when the unexpected occurs? Exapilot navigates operators through each step of an operation and prevents them from making mistakes, and even issues timely alarms when a hazardous abnormality is detected in a process. The standardization of operations improves product quality, shortens production cycle time, and reduces transient product. This results in reduced utility costs and enables plants to operate with smaller inventories.Exapilot solves this problem. Exapilot takes the know-how of your best operators and transforms this into standardized procedural flowcharts that your operators can use to navigate flawlessly through an entire process. By eliminating operator errors and production losses, efficiency is improved and total operating costs are reduced. Since Exapilot was first released, over 1,000 licenses have been sold to companies all over the world, and the majority of users have come from the chemical, petrochemical, and oil & gas industries. 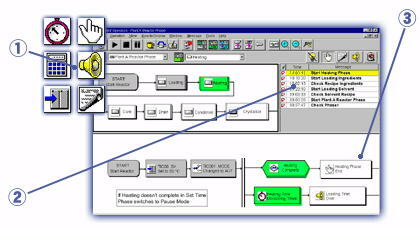 Exapilot uses icons to represent standard plant operation elements. Just position and link the icons in a sequence to create a standard operating procedure. Create simple hierarchical sequences to represent complex procedures. Configuring Exapilot requires no special engineering skills. At each step in a process, a dialog is displayed on the screen to indicate what action an operator must take next. An interlock sequence can be configured to prevent operators from omitting a step. Procedures for opening valves, ramping, level checks, and starting/stopping pumps can be automated. Exapilot provides seamless connection to production control systems (PCS) via a standard OLE for Process Control (OPC) interface. No PCS engineering is required. Exapilot has been optimized for Yokogawa's CENTUM series PCS, but other companies' DCS and PLC systems are supported as well. A workflow created with Exapilot can be printed out with a self-documentation function for use as a standard operating procedure (SOP). By using the debugging function in trial mode, Exapilot can be used as an operation simulator. Plant data can be imported into Exapilot in real time to run simulations without disrupting actual plant operations. The use of Exapilot to automate non-standard operations allows your most experienced operators to spend more time enhancing and optimizing operation procedures throughout your plant. This improves efficiency and reduces operating costs. Windows 7 Professional Edition SP1 (32-bit) supported for Exapilot client only. PCS output confirmation function enhanced. Operation comment input function added. Enables users to export all of Exapilot's main procedure settings (procedure flow, unit procedure definition information, system information, and additional comments) to a Microsoft Word file. This gives users greater freedom and convenience in how they use Exapilot data, allowing them, for example, to produce SOPs and management documents. Enhancements in builder window functions. New rich text format (RTF) editor, page setup, and grid line display functions give users increased flexibility in how they edit and print out Exapilot procedure flowcharts. 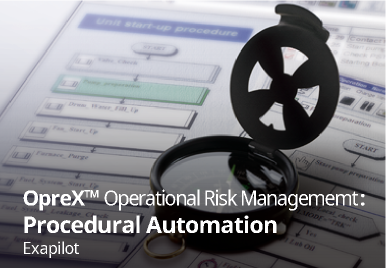 Configuration of complicated procedures in Exapilot leads to operational excellence. DENKA wanted to standardize the operation, reduce workload and prevent operator errors. Process plants require operational procedures in order to produce products. These procedures consist of a set of tasks that are executed in a consistent manner to achieve a specific objective such as starting up or shutting down, or transitioning to a different product. The level of detail, purpose and frequency of use of these procedures varies by process, company and site—but in all cases these procedures should be the basis for plant operations. Manual operations live on and even thrive in largely automated process plants, and they are often the cause of safety incidents.